Grand and Driggs seems rather a strange place for a movie theater, and 6 theaters and 850 seats seems like a lot to cram into a three-story (50'-high) building. But the owner seems serious about it. They've already filed an application at DOB (no permits have been pulled - the plans were disapproved at the most recent plan exam, which is nothing unusual). The architects are out of Philadelphia, and specialize in, among other things, movie theaters (including a quite stunning restoration of the Amber Theater in Pennsylvania). 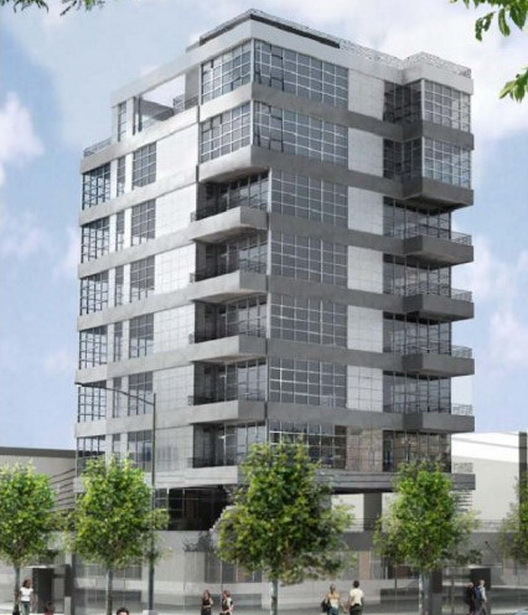 This is not the first application to be filed for this property - prior to the Grand Street rezoning, a previous owner had plans for a mini-tower. That job was approved, but no permits were ever pulled and the project never got into the ground. More recently, Winick was shopping around this Karl Fischer design (conjectural only) for a two-story retail building.